When writing for a general audience, we want to ensure that the language we use is clear—the opposite of the kind of bafflegab we looked at earlier. ☐ Language is clear and vocabulary is appropriate to the audience. The key to keeping your language clear is ensuring that everything can be understood in context. This often requires a careful balance between the concrete and the abstract. Information technology solutions is an abstract. Computer networking hardware is slightly more concrete. Better still is devices that connect your computer to the Internet. Use as many concrete examples as needed to keep your reader grounded in the topic. It does a novice little good if you tell him he has a DSL connection instead of dial-up. But tell him he can download a TED talk in 1 minute rather than ten minutes, and you’re begin to get through. Sometimes, in a very technical text, we need to use obscure or unfamiliar terms. For example, I am currently reading a Bible study on the book of Daniel that’s aimed at the general market, rather than a scholarly audience. A study of Daniel for the scholarly market could use the word eschatology without comment. In a book for the general market, however, the author must take care to define this word not only the first time it appears, but once or twice subsequently. How often you do this will depend on the expertise of your readers. Whatever the jargon of your field, remember that you may have some readers who are newbies, and give them definitions for the words they may not know. Remember that your readers don’t know everything you know. They may be very new to your topic. In The Sense of Style, Steven Pinker writes, “The main cause of incomprehensible prose is the difficulty of imagining what it’s like for someone else not to know something that you know.” This is the Curse of Knowledge. 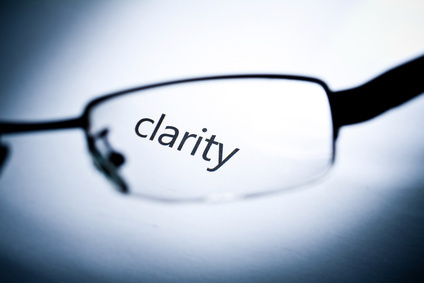 Another key to clarity is breaking concepts down into their component parts. Experts tend to store their knowledge in large chunks, whereas a novice needs to think in terms of the pieces that make up the chunks. I’ve run into this problem myself in trying to explain viewpoint to novelists. Because I’ve studied the subject for so long, I think of viewpoint as a single entity. But it’s actually made up of multiple parts: character, grammatical person, psychic depth…it’s very complex, which is why I can’t just say “you must control the viewpoint.” I’ve written multiple articles and barely scratched the surface. When I teach it as a seminar, it takes 90 minutes to explain it all. Consider where you’re lumping together a set of concepts as one unit, which a novice will need explained piece by piece. Keeping your reader in mind as you write is only the first step in overcoming The Curse. Asking nonexperts for an opinion is the best way to discover whether your writing is clear. If the nonexpert can read your text and get your point, you are well on your way. This entry was posted in Editing and tagged Edit Like A Pro, Elements of Nonfiction, Voice, Writing.